One of the results of the way in which cycles combine to influence financial markets is something Hurst called the “Mid-Channel Pause”. 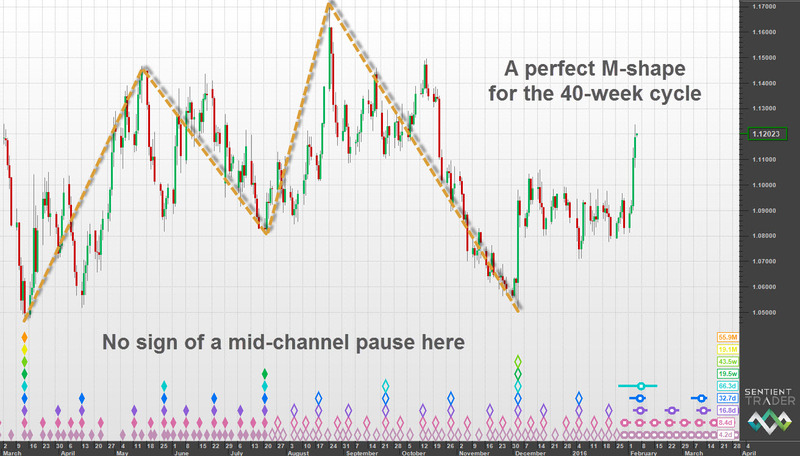 The mid-channel pause is, as the name implies, a pause in price movement which occurs “mid-channel”. But you don’t need to construct any channels in order to identify the mid-channel pause. It is simple to identify, and is a wonderfully powerful cyclic structure which gives you a real edge in terms of knowing what to expect next. Mid-channel pauses offer that rare trading opportunity: a high-confidence, highly profitable trade. This week the EURUSD forex pair provided us with a text-book perfect example of a mid-channel pause, and so I am taking the opportunity to record this example, in the hope that it will provide a good reference to help you identify mid-channel pauses in the future. First of all, what is the mid-channel pause? Price is represented in the graphic by means of the green line, and it is calculated as a composite of the three cycles shown at the foot of the graphic (the red, blue and orange lines). This combination of cycles is probably familiar to you – it is the way we Hurstonians usually explain how multiple cycles combine in a price movement. Why does the mid-channel pause form? The mid-channel pause forms because of the way in which cycles combine to influence price movement (according to Hurst’s Principles). In particular the way in which three cycles combine (three adjacent cycles in the nominal model). In the graphic above it can be seen that as the shortest (orange) cycle is forming a trough the next longer (blue) cycle is forming a peak. It is this combination of contradictory impulses that results in the mid-channel pause. 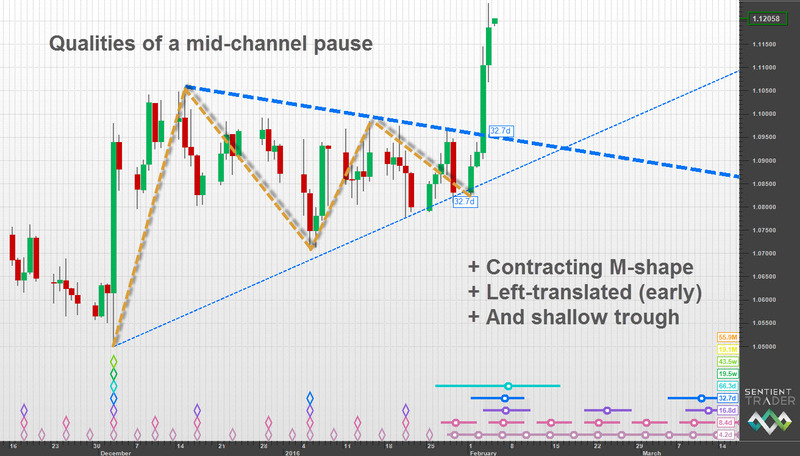 When does the mid-channel pause form? The mid-channel pause forms on the way up at the first trough of the cycle which is two degrees shorter than the cycle which formed the “initial” trough. That is a bit of a mouthful, so let me try to clarify … in the graphic above the left edge of the graphic is where the red cycle is forming a trough. I call this the “initial” trough because it is where the pattern starts. The cycle two degrees shorter than the red cycle is the orange cycle … and so the mid-channel pause forms at the first orange cycle trough. On the way down the mid-channel pause forms at the last trough of the cycle two degrees shorter (before the final trough of the longer cycle). There is an important subtlety that I have highlighted in the above graphic. Notice how the mid-channel pause on the way up is left-translated. In other words the actual trough in price (the green line) occurs to the left (or before, considering that the x-axis is the time axis) the actual trough in the orange cycle. And the mid-channel pause on the way down is right-translated. This is really important, and is not some kind of “the markets are not perfect” expectation – it is the simple result of the mathematics of combining the cycles. It is worth stating this point again: The trough in price occurs before the trough in the cycle on the way up, and after the trough in the cycle on the way down. What can we expect from a mid-channel pause? A mid-channel pause is a time of consolidation, a pause in price movement. This very often manifests as a contracting triangle. Other classic consolidation patterns are also found. 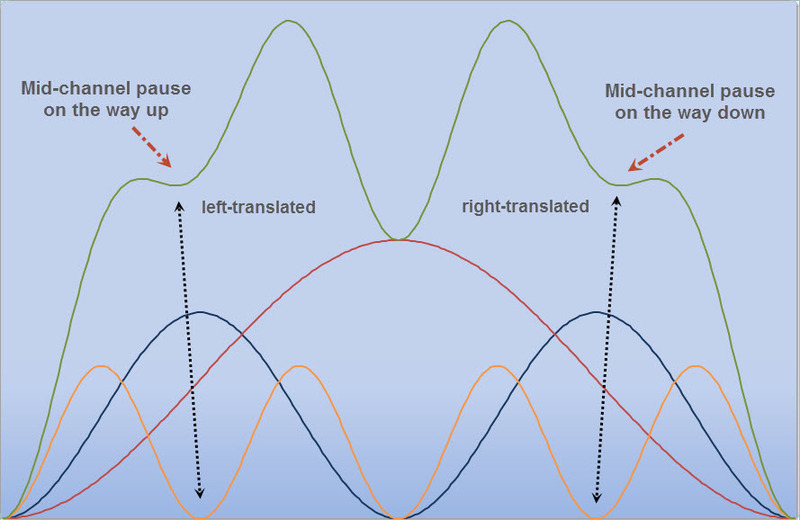 The trough of the cycle at which the mid-channel pause forms is left-translated. Which means that we expect the trough in price to occur before the trough of the cycle is expected. When we see a mid-channel pause forming we should stand by for an earlier-than-expected bounce out of the trough of the cycle that is the shortest cycle in the mid-channel pause formation (the orange cycle in the graphic). The trough of the cycle at which the mid-channel pause forms is a shallow trough. This means that we do not expect price to come down into an obvious trough of the cycle that is the shortest cycle in the mid-channel pause formation (the orange cycle in the graphic). Combined with the fact that this trough can occur early we need to be ready to take quick action with a mid-channel pause, not wait around until we have seen a good clear trough form. The long cycle, the trough of which I consider the “initial” trough is the 40-week cycle, and the initial trough occurred on 3 December 2015. The 40-week cycle is therefore the red cycle in the graphic above. The mid-channel pause is expected to form at the first 80-day cycle after that trough. The 80-day cycle is two degrees shorter than the 40-week cycle (40-week > 20-week > 80-day). The left-translated trough in price – that very perfect nest-of-lows for the 80-day cycle is centered around 6-7 February 2016, whereas the trough in price formed about a week earlier (29 January 2016, or one could argue that it occurred over the weekend of 30-31 January 2016). And the trough is a very shallow trough. If we accept the trough on 29 January 2016 as the trough of the 80-day cycle, then price fell for only one day into that trough! Not what you would normally expect from an 80-day cycle trough. But how do we know that the 80-day cycle trough has occurred? What if price suddenly drops to form a more impressive trough? We can use another useful tool in the Hurst cycles toolbox to confirm that the 80-day cycle trough has occurred … the VTL. And so we have confirmation that the 80-day cycle trough has formed, despite the fact that it is only expected in the next few days. 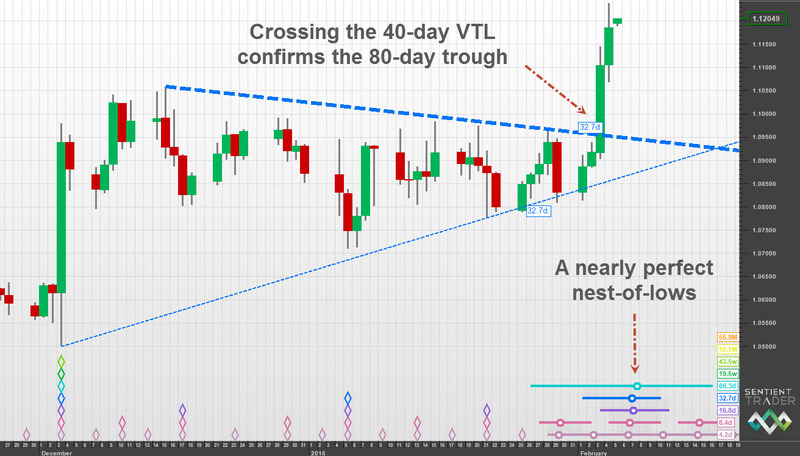 Some VTL confirmations should be taken with a “grain of salt”, but this confirmation looks pretty good to me. The VTL of the cycle which provides the confirmation of the trough often provides a very good entry point for a trade out of the mid-channel pause. You probably know that I find the FLD a very powerful trading tool. The FLD trading strategy is based on the reliable sequence of interactions between price and the FLD. It is no coincidence that the FLD trading strategy considers the combination of three cycles, the number required for the mid-channel pause to form. A B-category interaction occurs as price moves down to the first trough of the signal cycle. Price approaches the FLD where it is expected to find support. Price then forms the trough of the signal cycle, and bounces up and away from the FLD in the C-category interaction. 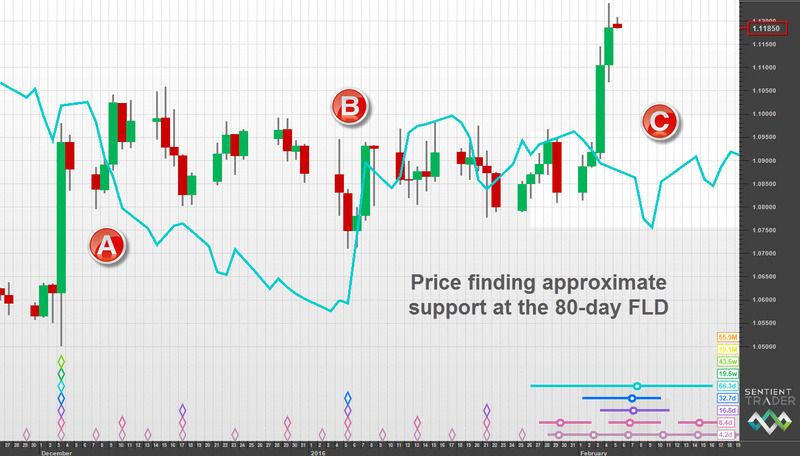 It is not unusual to see price tracking along the FLD between the B & C category interactions. The signal cycle on the FLD trading strategy is the shortest of the three cycles … our orange cycle in the graphic above, and the 80-day cycle in this EURUSD example. The mid-channel pause occurs at the first trough of the “signal” cycle, which is where we expect the B to C-category interactions. And we expect price to track along the FLD as the mid-channel pause is forming. Notice how price found support at the 80-day FLD, and then tracked roughly along the FLD before pulling up in the C-category breakout interaction. Of course we have an added complication here: the 3:1 harmonic ratio between the 54-month and 18-month cycles. But that would not change the possibility of the formation of the mid-channel pause very much as it has more to do with the harmonic ratio between the 18-month and 40-week cycles. And so be aware that mid-channel pauses do not always form. But when they do form they offer wonderful trading opportunities. Perfect ! Thanks for reminding David ! Dominancy Envelopes can help to read and structure the various Mid-Chanel Pauses. very often Mid-Channel Pauses includes Mid-Channel Pauses of lesser degrees. Channels (or Dominancy Envelopes) can help you to analyze correctly Mid-Channel Pauses ! This MCP 256 was created by the 1 Year Cycle (256 Trading Days) which developed since the Low of October 15 th 2014 which lasted to September 24 2015. Both Lows are noted B3 in red. B3 means that the price has broken or touched succesively 3 Envelopes. This 1 Year cycle lasted in fact 238 Trading Days, 93 % of the theoretical period of the Cyle. 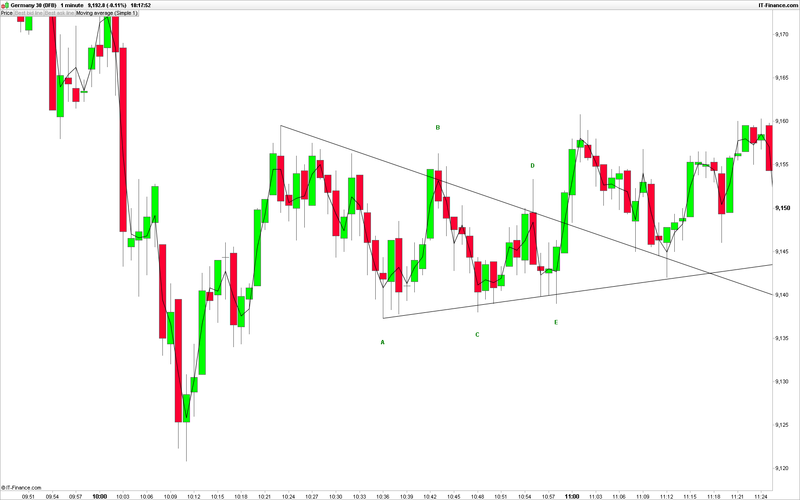 Here is a MCP I came across today in the DAX, via the 1 minute chart. I have labelled the EW triangle too. Hello gostin, yes indeed you can use an 80-day cycle. We have many videos and resources, send an email to support and they’ll help you out.